There are lots of reasons why you may need to quickly plot out a data graph. In some cases, you might be putting together a presentation for work, and you just need a way to represent raw data in a graphical format. Or, maybe you're working on an assignment for school, and you need to present information in a bar chart or a line graph and you don't have any software available to do it. There are plenty of websites available on the Internet that can help you accomplish that task. All you need is the data that you're trying to graph, and some idea of how you would like your graph to look. If you want an effective website for plotting data graphs, it should be one that requires very few steps to create the resulting chart. All of the websites listed below provide the graphs in one or two very simple steps. The first example is ChartGo, a website dedicated exclusively to creating graphs online. At ChartGo, you'll find a single page where you fill out all of the details for your graph. Do you want a line chart or a bar graph? What about the height, width or orientation and fonts? You can quickly type your data into the "Chart Data" section on the same page. When you click on "Create Chart", the web app automatically generates a chart on the next page with all of the parameters you've defined. 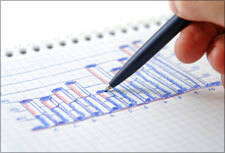 The charts that you can create here are well-designed and look great. You can right click on the graph and save it as an image, or you can use the links provided at the bottom of the page to share the chart on social websites or embed it into your own blog. Another great website for designing charts online is ChartTool. When you click "Create Chart" on the website's main page, you'll enter into the graph design area where you can choose from a decent selection of graph types - line, scatter, bar, meter and more. Scroll down the design page to fill out more of the graph details, like the title, axis labels, and of course the data set that you want to plot. When you're done, the site will plot out your data points in a very professional looking graph, complete with gridlines, x and y labels, and a colored trend line that shows the plot of your data points. If you're looking for an even simpler website for quickly plotting out data points, and you're more interested in just having a scatter plot rather than a line graph, then head on over to MathCracker. MathCracker offers a very easy online tool that will create a scatter plot of your data points. All you have to do is use the one-page form to fill in the data for your plot. You list your x and y coordinates in a comma separated list on one line. You can define the chart title and the x and y labels, and then click "Graph it" to get your plot. With your generated plot, you can right click and save the image to use anywhere - on your own website or in a report for school. Keep in mind that when you are creating graphs, you can either use a defined set of data points, or you can use a function that describes the behavior of that graph as you type in data points for "x". Some websites let you graph those functions, such as the Grapher tool provided by iTools.Subhasbose.com. With this tool, it really is just as simple as typing in the formula that you want to graph. For example, one of the simpler graphs to try is X-squared, or X to the power of two. With grapher you type exponents by using a "pow" function. When you plot that function using this web tool, the result looks like the chart below. The Grapher charts are also well presented, with different colors for the x and y lines, a distinct color for the plot line, and even a pop-up of X and Y values as you slide your mouse back and for along the plotline. A similar plotting tool can be found on the "Maths Online" page of a German University website. Scroll down to the bottom of the page and click on the "maths online funktion plotter" to get to the pop-up tool. On this easy to use web tool, all you have to do is type a function, one at a time, into the field at the bottom of the window. The web app will chart that function. Then, you can enter another function and it will also plot that line in another color. This makes it very easy to compare different functions and the effects of changes on the x and y plots. The final tool is located at a website called Cours-De-Math.eu. This is a one-page tool where you can tweak the features of up to three graphs, and compare all three on the plot display to the right. This is another well-written tool that quickly displays function charts in a way that makes it very easy to analyze and understand the formulas that you're working with. As you can see, plotting data points and formulas doesn't require expensive computer software. All you have to do is use any of the websites listed above, and you can plot out your own graphs and data plots for absolutely free.